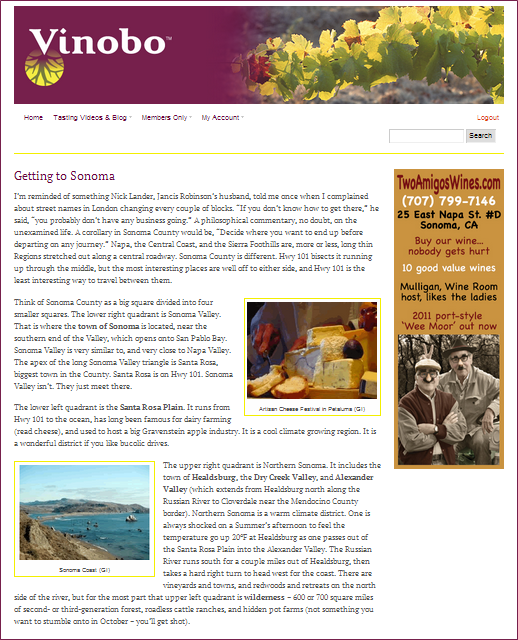 For this theme tour, we’ll visit five Sonoma wineries with backgrounds different to those found in Napa. Instead of French Champagne houses, we’ll visit a Spanish Cava house and a German family ~ perhaps not such an obscure concept when one considers the role of Krug, Bollinger, Deutz, and Heidsieck in the history of Champagne. Once you take this SPARKLE TOUR, I want you to feel confident you can comment authoritatively on sparkling wines anywhere ~ from Champagne to Cava to Prosecco, from France to Australia to New York. Owned by Taittinger. Very up-market. Their best item, called Le Reve (the dream), is extraordinary for CA because of elegant, focused style. Walter Schug was a ground-breaking winemaker at Phelps, before starting own place in Carneros. Exceptional rosé. Spanish Cavas house doing exceptional work on clonal selection of Pinot Noir, not just as table wine, but to enhance the bubbly too. Small winery with emphasis on vineyard operation. Makes pretty nice range of sparkling wines against all odds. Long-time stalwart, overlooked in early years by the dazzle of the French houses. Now frequently beats them in competitions. Daughter of the owner of Jordan Winery, went her own way to source cool climate fruit, and make excellent sparklers at facility which originally housed Piper-Sonoma. Historic Napa property (Jacob Schram) features caves hewed by Chinese ‘coolies’ with picks. Resurrected in the early 1960’s. TV producers buy famous sparkling label (H. Kornell). They continue to make fizz, despite success of Cab from own vyd. Brought to Napa Valley by pioneering giant of NY State industry (Guy DeVaux, who had worked with Charles Fournier at Gold Seal). Owned by French house G.H. Mumm. Nice photography exhibit. First French Champagne house to try luck in California. Dates to early 1970’s, and the entrepreneurial John Wright, who not only saw development of Carneros district, but saw Frenchmen doing it. Champagne, as any Frenchman will tell you, comes only from the four departments of the Champagne & Ardennes Region in Northern France. All Champagne is sparkling wine; only some sparkling wines are Champagne. At the end of World War II all the wine producing countries of the world agreed not to poach the name of France’s most famous luxury product. The only country not signing that agreement was, you guessed it, the United States. Shameful. What a way to repay the French for their aid in the American Revolution. It’s not that excellent sparkling wines can’t be made in California. They are being made here. The issue is that we shouldn’t steal a French place name. It would be like a giant co-op in the Languedoc calling one of their wines Napa Valley Cabernet Sauvignon, and selling it for $50 a bottle in Hong Kong, Shanghai, and Tokyo. I’m inclined to the position: If it is made in California, and says ‘Champagne’ on the label, it’s junk! No sparkling wine producer with any respect for a wonderful tradition would do otherwise. Which brings us to the matter of cost. There is a Federal excise tax of $0.70 per bottle placed on every bottle of sparkling wine sold in the U.S. It was originally a war-time luxury tax, never repealed. Seventy cents paid by the producer or importer looks more like $2.50 per bottle by the time it gets multiplied through the three-tiered distribution system for $6.99 in Atlanta, what could possibly be in the bottle? If a bottle from California labeled ‘Champagne’ is selling at retail for $6.99 in Atlanta, what could possibly be in the bottle? The winery is seeing less than $3.00 per bottle after sales expense. They’ve got well over $2.25 in tax and packaging alone. Somebody is taking a bath. Probably the grower. So the question becomes, where best in California to conduct a comparison of sparkling wines? Mendocino has the French Champagne house of Roederer in the Anderson Valley. They do a magnificent job. And, for a number of years, the French firm of Pommery owned the winery started by John Scharffenberger (of chocolate fame) also in Anderson Valley. But Pommery has now exited the picture, and Scharffenberger has returned as the brand name. On the inland side of the mountains, at a custom-crush facility near Hopland, Piper Heidsieck has their Piper Sonoma brand made for them. Quite competently I might add. Nevertheless, Mendocino comes up a little short. Better you privately compare a bottle of Roederer Estate’s Anderson Valley L’Ermitage side-by-side at dinner with the Louis Roederer Brut Premier from Champagne. Good comparison; tough competition; great dinner. We have GOT to do this again sometime! San Luis Obispo has Laetitia, the former Maison Deutz facility on the coast at Arroyo Grande. Cold climate; big planting of the true Pinot Blanc grape; damn good product. But it is just one place. Napa has some bodacious name recognition with three French houses: Moet-Hennessey (Dom. Chandon); Mumm, and Taittinger (Dom. Carneros). Plus the longstanding American house Schramsberg, and Frank Family wines, which bought Hanns Kornell, and today make about 5,000 cases total of five different sparklers. Yet I often think of sparklers in Napa as gilding the lily. I’m afraid you’ll end up lulled into the sloth of luxury, unable to make critical discriminations. Furthermore, you will never get to try French Champagnes simultaneously with their California counterparts in any French owned Tasting Room! So perhaps you should set up the French / California side-by-side comparisons for Napa in the comfort of your own living room instead. See if you can discern the provenance of each wine blind. It will be some kind of party: Dom Perignon vs. Dom. Chandon’s Étoile Tête de Cuvée; G.H. Mumm 1999 Cuvée R. Lalou vs. Mumm Napa DVX 2006; and Taittinger’s Comte de Champagne vs. Dom. Carneros Le Reve. What a line-up! Sounds like The Rapper’s Rapture Unwrapped. Serve seared scallops, maybe sneak in a little out-of-state foie gras. Who cares? You’re getting a call from the IRS next morning anyway. My guess: Le Reve steals the show.